Getting Ugly: The only consensus is that this is the ugliest building in town. With a special election on the cards, Mayor Mike Rotkin and Councilmember Ed Porter take off their gloves and duke it out over the Coast Hotel project. Recently, in downtown Santa Cruz, a trip to the post office, the supermarket or the library has taken on an added dimension: You have to navigate the host of petitioners, who are variously opposed to, or in favor of, the Coast Hotel project and want your support for their cause. Amid this clutter of clipboards, fliers and accusations of obstructionism from both sides of the political equation, (see Nüz)--it's been easy to lose sight of the actual reasons why one side thinks this development will save Santa Cruz's soul, while the other thinks it will doom us to permanent Hotel Hell. With the signature-gathering period now over, and the city waiting to see if a special election is actually in the works--an eventuality that looks fairly likely and should be officially decided by May--we bring you Mayor Mike Rotkin, who supports the current project, and Councilmember Ed Porter, who opposes it, to wage their battle of the Coast Hotel, here, on the pages of Metro Santa Cruz. Opponents of the proposed new hotel and conference center are systematically misleading the public about the many benefits of the proposal and grossly overstating its negative impacts. One could argue in favor of the proposed new hotel even if it were not going to bring substantial revenue to city government. We will be replacing the ugliest building in Santa Cruz with a beautiful new hotel. No one can keep a straight face and suggest that the appearance of the new hotel won't be a dramatic improvement. The new hotel will be less tall, pull back significantly from the beach and allow for less runoff than the existing hotel. It will expand the public access to the beach on both sides of the hotel and provide better public views of the wharf and bay from the road. The hotel will be built as an energy- and materials-efficient "green building" that will meet the U.S. Building Council's silver-level requirements. The proposed garage will provide parking not only for the hotel and conference center guests, but also badly needed additional parking for the general public as they visit the beach, the proposed new Sanctuary Visitors Center and City Natural History Museum. The hotel owners have willingly signed enforceable contracts to build the hotel with union labor and to run it with union labor (as they currently do). This will guarantee year-round union jobs, which are rare in the local tourist industry. Fortunately, the proposed hotel and conference center/garage will also provide significant new revenues to the local community as well. The city, which faces a serious budget crisis, has been forced to lay off 70 positions in the last 2 1/2 years, reduce social service funding by 15 percent, and reduce public safety positions, park and street maintenance. We have closed our pool in the winter, teen center two days a week and Louden Nelson Community Center one day a week. We now have one park ranger to patrol the entire city greenbelt. Without this proposal, further cuts can be expected. The conference center/parking garage on the non-ocean side of West Cliff Drive is a necessary component of this proposal. Without it, neither the hotel owners nor the city's financial consultants believe that the hotel will generate enough business in the winter to justify replacing the old Dream Inn. The city is willing to build (and own) the conference center/parking garage because we, and not the hotel owners/operators, will benefit from the new taxes that this project will generate for the city and its residents. We will pay for our share of the project entirely out of taxes generated by the project itself. This project will generate new property taxes, hotel room taxes (TOT), sales taxes and parking fees that will exceed $2.7 million dollars per year. For the first 25 to 30 years, all but one-half million dollars per year will be used to pay off the bonds necessary to build the conference center/garage. This half-million dollars represents more tax revenue each year than is generated by all of Pacific Avenue business combined. After that time, the city and the community will be able to use the full $2.7 million for local General Fund expenses. The project also generates large secondary local spending (jobs) and sales taxes from conference and hotel visitors. Opponents of the proposed new hotel have argued that it will have terrible impacts on the community. They have described the conference center as "gargantuan." In fact, the proposed six-level (four-story) garage will be only nine feet higher than the existing condos across Bay Street. Fears of massive traffic impacts are also grossly misleading. On a typical summer weekend, the beach area has 50,000 visitors. The new hotel will add 107 new rooms. The 1,200-seat conference center will mainly operate in the off-season, when there are far fewer cars in the area. The conference center itself makes no direct money for the hotel operators, and hotel rooms will be full already in the summer. But even if there is a party or wedding at the conference center in the summer, it is unlikely to make a noticeable difference with 50,000 people already there. That is why the official traffic studies required in the project's environmental impact report indicate that traffic congestion will actually be reduced with the replacement of three stop signs with traffic signals--signals paid for by the hotel developer. The one real negative consequence of this proposal will be shadows on and blocked views for some of the residents of the Clear View Court Mobile Home Park. That is why the City Council committed up to a $1.5 million in low-income housing money generated by the project to address the reasonable concerns of the affected residents. Opponents have no credible alternatives to suggest for raising city revenue. The alternative sites for a conference hotel they are proposing have already been either rejected by the local community (often including those who now disingenuously advocate for them) or by the property owners and investors who would have to build them. The hotel/conference project is supported by the majority of the Santa Cruz City Council, every union, virtually every social service agency and every organization representing local business in our community. What exactly is it that would allow the opponents to this project to label their position "progressive"? 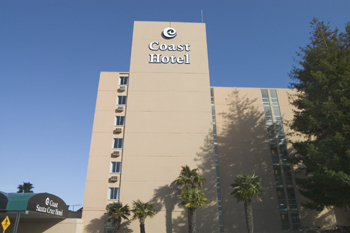 Most people in Santa Cruz have been talking about the Coast Hotel Proposal. While we should develop a conference center/hotel facility, the current proposal is complex and problematic. I have spent a good deal of time working for improvements to the proposal that would remove some of those problems. Yet, I voted No on the project. Here's some of the reasoning that led to my vote. First, I had assumed early on that there would be four or more City Council votes to approve the hotel-conference center project. As a result, I set about working as hard as I could to alter the project. On the whole, I was very successful in that effort. Maybe 100 percent successful since (I think) ALL of the modifications I proposed were approved and, I think, unanimously! Backing up in time, I submitted something like 20 pages of comments on the draft Environmental Impact Report (EIR). Take a look and you will find that nobody else submitted such a volume of comments. That's because I combined comments from several people and went through some process in talking about their concerns. Virtually all of the changes that I got included in the project were forecast by my comments on the draft EIR. Anyone who had read those comments would have known that my proposals were well founded. So, why the no vote? First, the EIR, in my opinion, is inadequate. Santa Cruz in particular has a history of making sure that an EIR would truly address all of the real impacts of a project. Certainly we want that to be true of the upcoming EIR when we consider the major potential impact from proposed University growth to 21,000 students. Or for big box stores in our neighborhoods. So, why not in this proposal? This EIR not only failed to address all the impacts, but also stated opposite views that simply were not true. For example, one section, which I quoted directly before my vote on the EIR, said that the effect on Clearview residents was not significant. It was pointed out that "significant impact" has a special meaning within the California Environmental Quality Act (CEQA). I was reminded of former President Bill Clinton's famous or infamous comment on the meaning of "is." I'm sorry, but I don't buy the idea of one meaning of "significant impact" in common usage and an opposite meaning under the law. I can't imagine how any educated person could draw such a conclusion about Clearview and I can't understand how they could accept this EIR under CEQA. My no vote on the project was a result of several compelling reasons, any of which is enough for a no vote, or a vote to delay until the unfinished work is done. 1. The impact on, and mitigation and/or compensation to Clearview residents was entirely overlooked. The modifications I proposed were only written the same day that we voted on the project. While I did work behind the scenes to be sure they would be approved, I'm stunned that we couldn't wait a few weeks and be sure we got it done right. If the rest of the project took over 15 months to prepare, shouldn't the plan for Clearview have taken more than 12 hours? 2. The traffic plan has not yet been done. Instead, there is a promise that there will be a traffic plan. I said from day one that I would not support the project if it could not keep a meaningful boundary between the new beach commercial area and the neighborhoods along Bay Street. That has to mean that most of the hotel traffic must not use Bay Street. Yet, we don't even have a rough draft of the plan to accomplish that. Just a promise to do it. 3. The project did not conform to our General Plan, our existing zoning, our Beach South of Laurel (BSOL) Plan or our Local Coastal Plan. Instead of waiting until the current General Plan revision process would consider these possible changes, we charged ahead without such a community discussion. I have to ask, do we want it to be done this way for the University's new LRDP? After we spend a significant sum of money revising the current General Plan, should we repeat what we are doing on the hotel project and throw out some section because somebody proposes a non-conforming project? If so, why even bother doing the General Plan update? Should we do whatever the political wind will bear? If a 50-foot wall was going to be built within 20 feet of the south boundary of your house, would you support the project because its good for the city even though you would never get any sun ever again? We could touch on several other noteworthy concerns such as the financing plan. But, in this space, we can't cover everything. But I hope the people of Santa Cruz will answer this question: should we discard parts of our General Plan in the interest of perceived economic expediency? If the answer is yes, then anything goes. If the answer is no then we ought to actually do the things we say we will do. Otherwise, why should our Planning Commission and so many other residents donate so many thousands of hours, year in and year out, to that work? Ed Porter is a member of the Santa Cruz City Council since 2000 and a teacher at Santa Cruz High School since 1980.